We will attend the meetings with you and offer you advice and assistance to see if we can negotiate an agreement with social services on your behalf. In some cases the social workers may feel that the risk of harm to a child is so great, or the case is so urgent, that the case should go straight to court. This is highly exceptional. We have a proven record of negotiating with social services to come to an agreement, avoiding court proceedings and enabling our clients care for their children. We will ask you to provide a copy of your pre-proceedings letter which will enable us to provide you with immediate cover for all your legal costs.If you are a parent or person with parental responsibility you will be entitled to legal aid and you will not have to pay for legal advice. You may required to attend more than one of these meetings in particular if there is some form of plan moving forward. 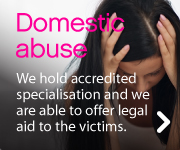 We will always ensure you are not left alone during this process which is daunting. Legal Help is always available for parents in these cases and anyone else who holds parental responsibility (anyone with an order saying the child should live with them usually has parental responsibility). Sometimes legal aid is also available for family members/carers even if they don’t have parental responsibility, but this will depend on various things including their income.